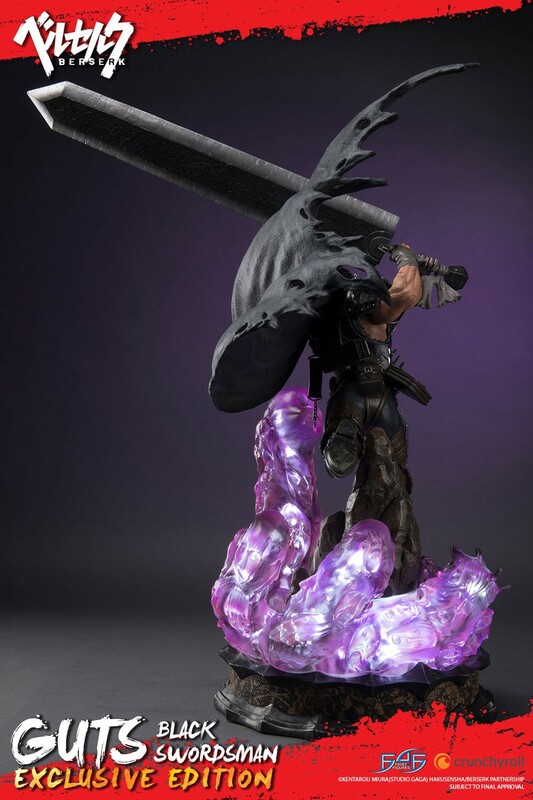 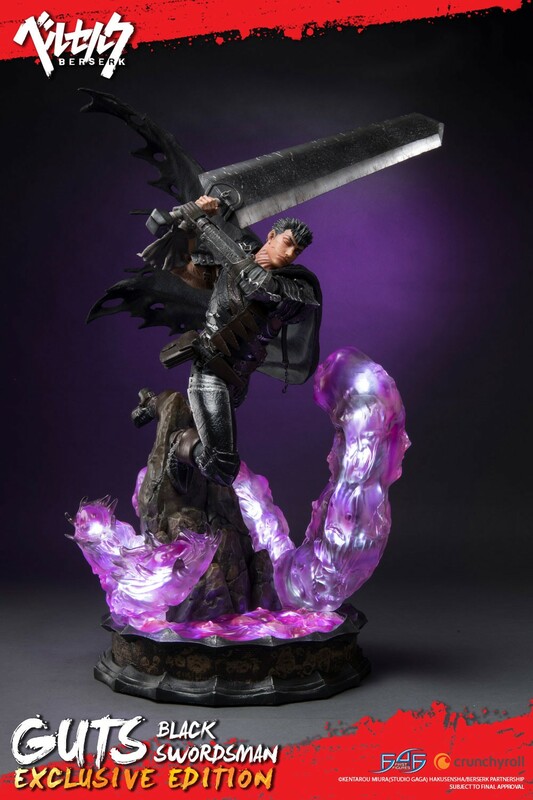 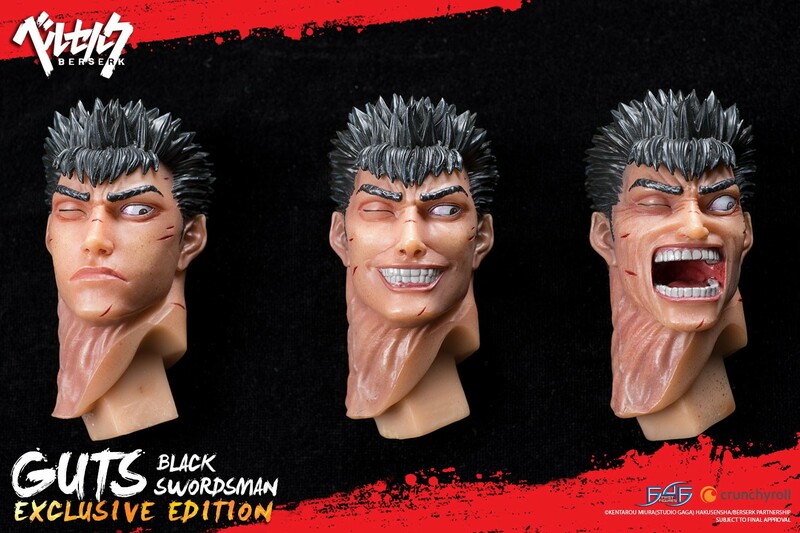 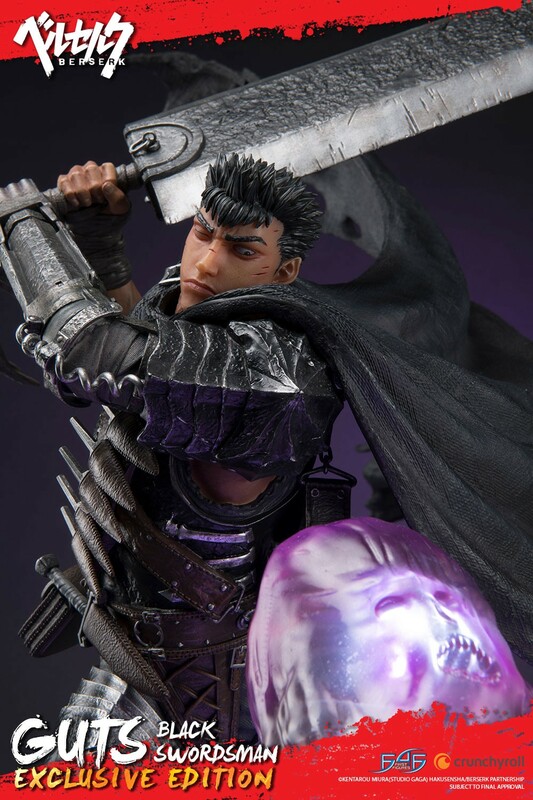 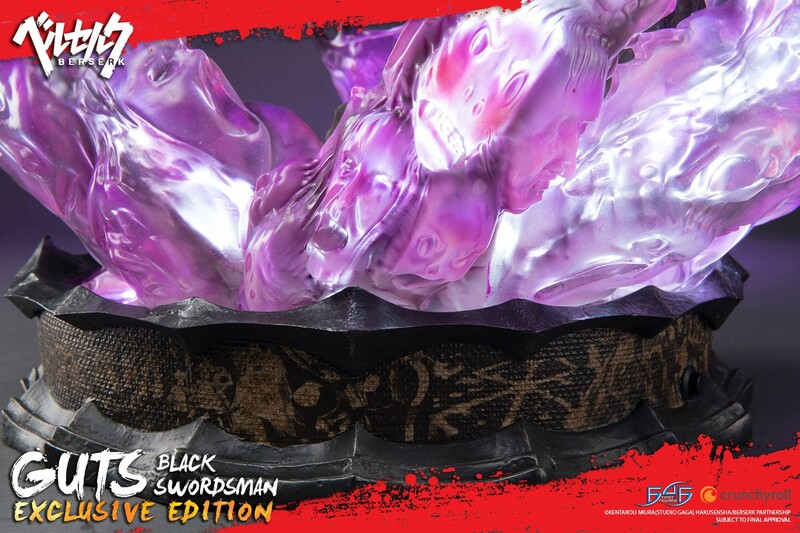 First 4 Figures is proud to present the highly anticipated Berserk: GUTS: Black Swordsman resin statue. 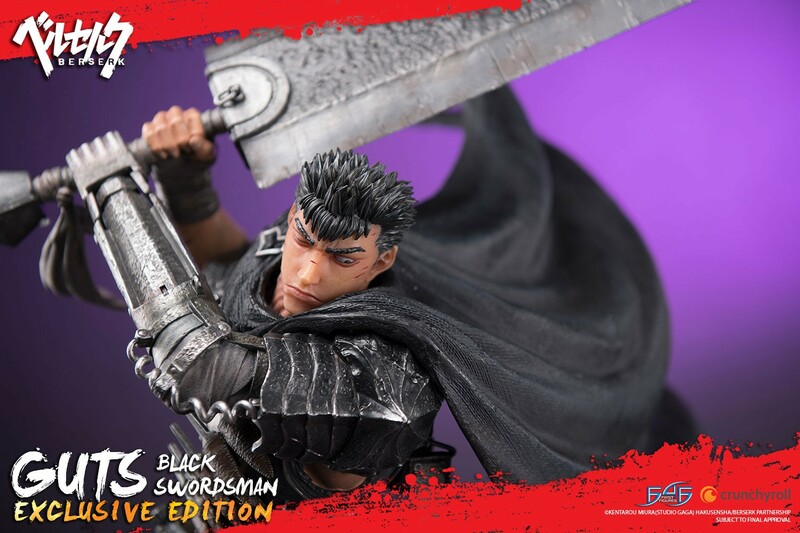 Also known as the Black Swordsman, Guts is a former mercenary and bears the Brand of Sacrifice (the brand marks those for a sacrificial ceremony in which an apostle or God Hand is created). 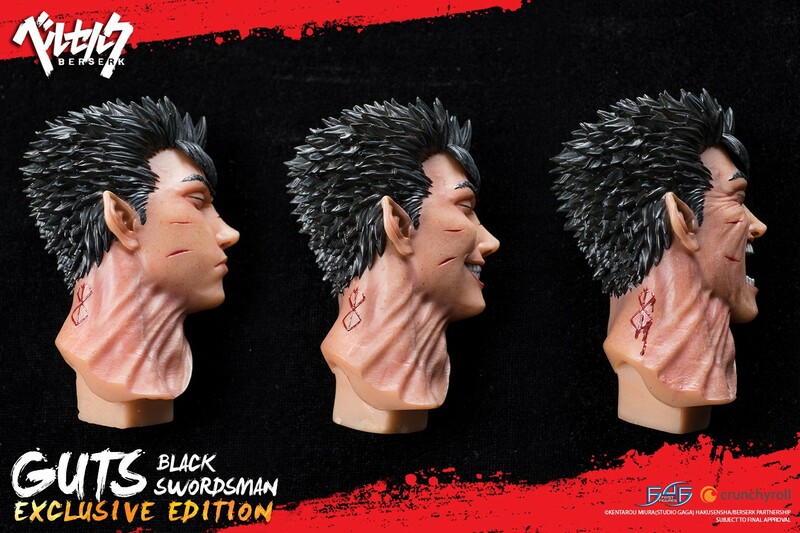 While traveling the world, Guts is in a constant internal struggle between protecting those dear to him and pursuing his own ends. 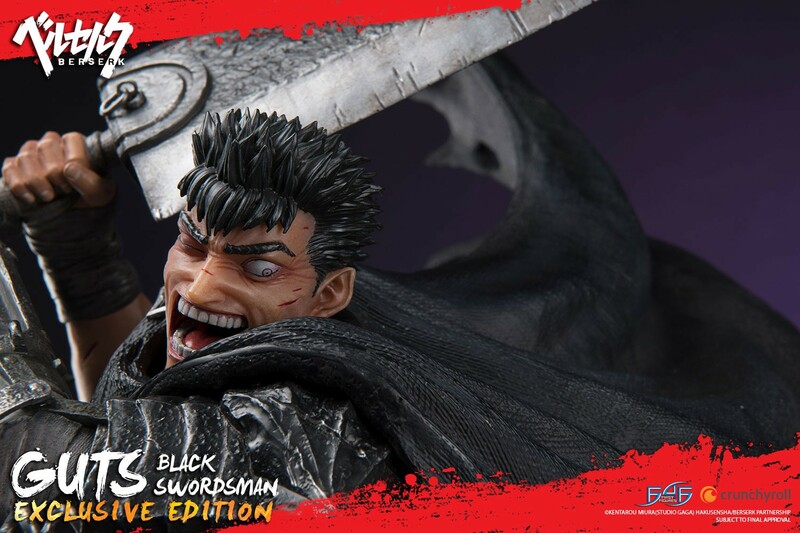 To further support our anime line, if by the end of this two-week pre-order period both Exclusive version variants combined do not hit a total number of 1,000 pieces sold, the pre-order period will extend until either 1,000 pieces are sold or until before production starts; if 1,000 pieces are sold during this two-week pre-order period, the pre-ordering process will proceed as normal and the Last Chance Weekend will take place as scheduled. 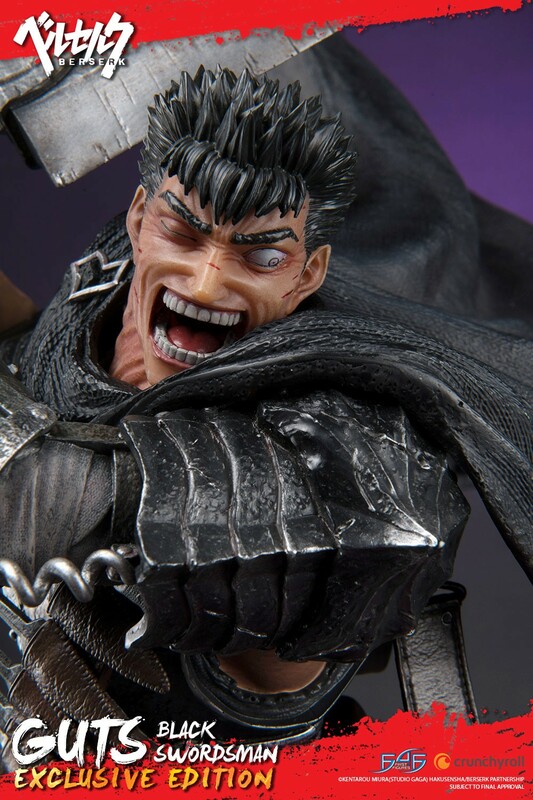 3 months x $163.00 + final balance ? 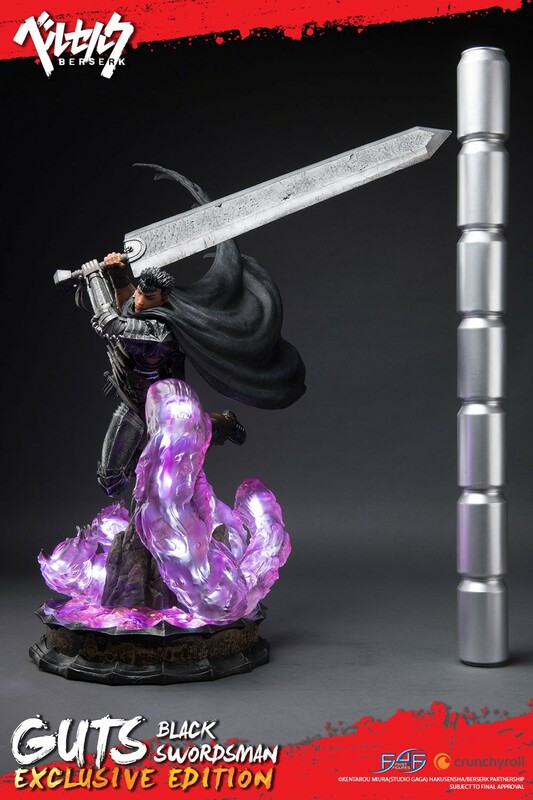 6 months x $93.00 + final balance ? 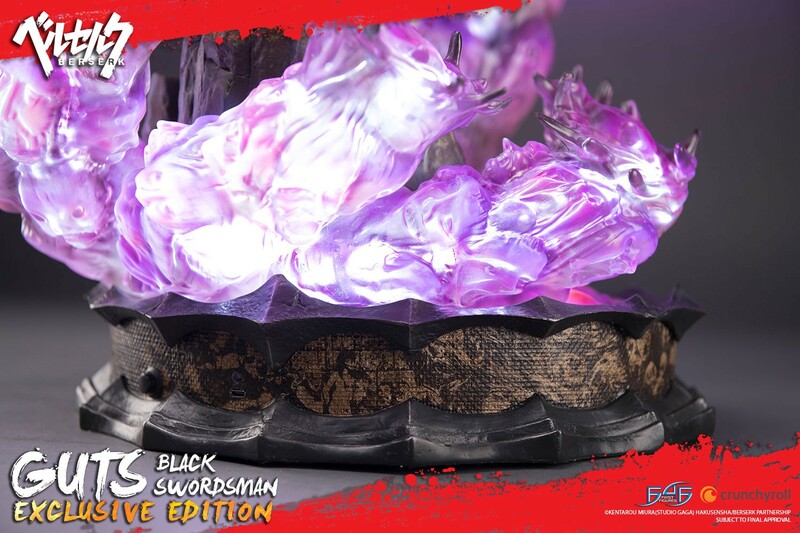 8 months x $73.00 + final balance ? 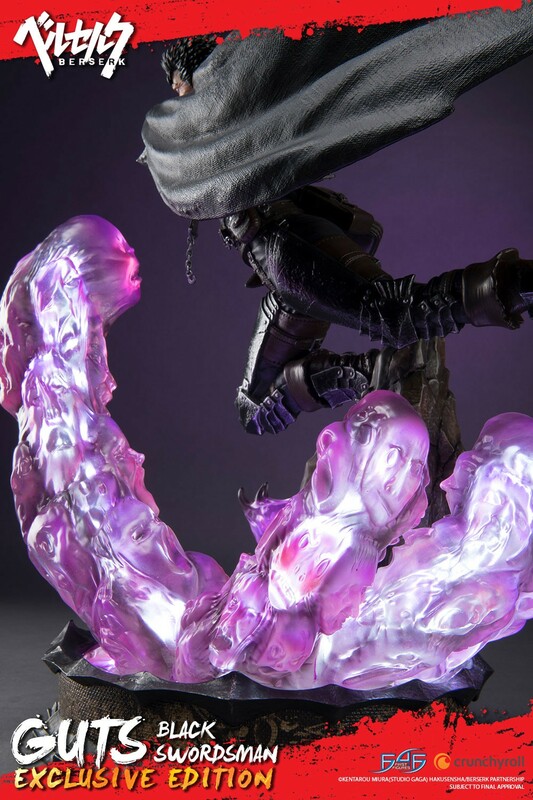 11 months x $54.00 + final balance ? 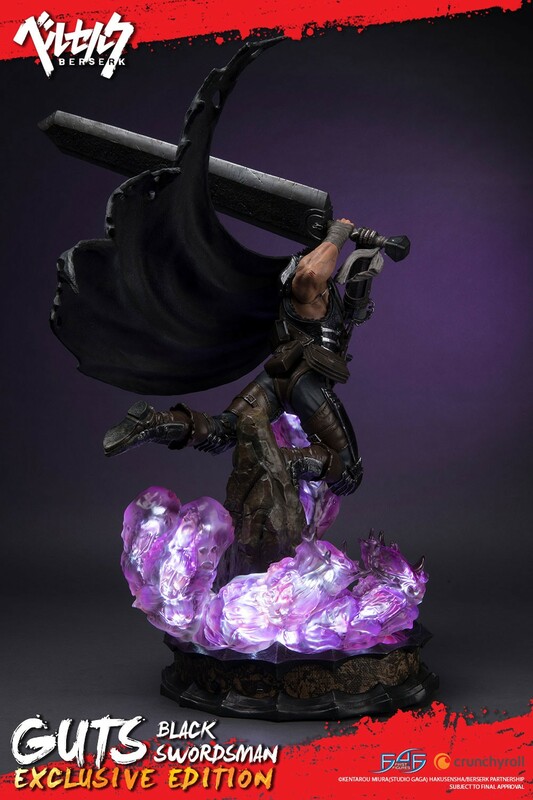 You will earn 3,625 F4F Reward Points for purchasing this product. 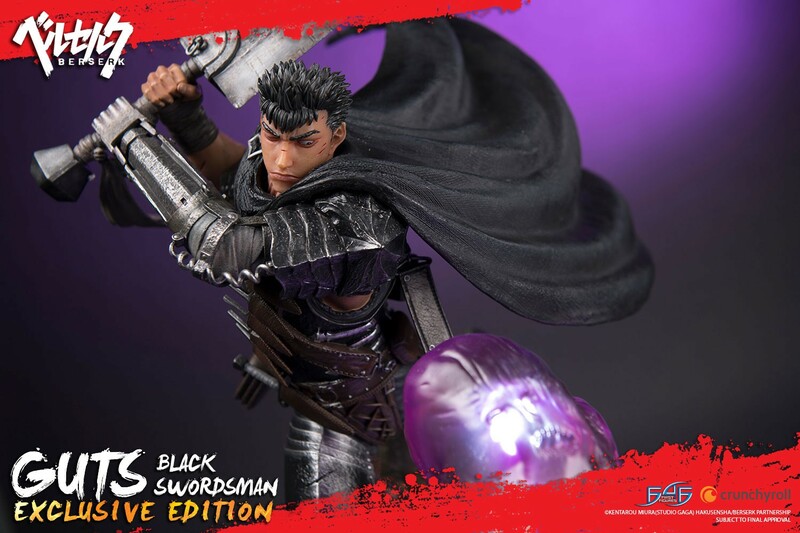 Driven solely by his will to live, Guts finds purpose in his life when he joins the Band of the Falcon. 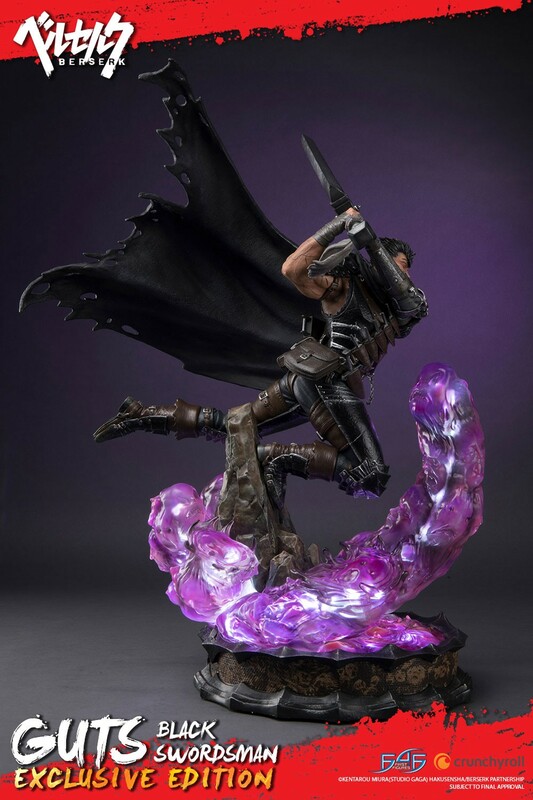 During his time as the Falcon's Raiders Captain, he greatly helped the faction's huge success during the Hundred-Year War. Eventually becoming dissatisfied with clinging to the dream of the leader of the Falcons, Griffith, Guts departs from the faction in pursuit of his own dream. 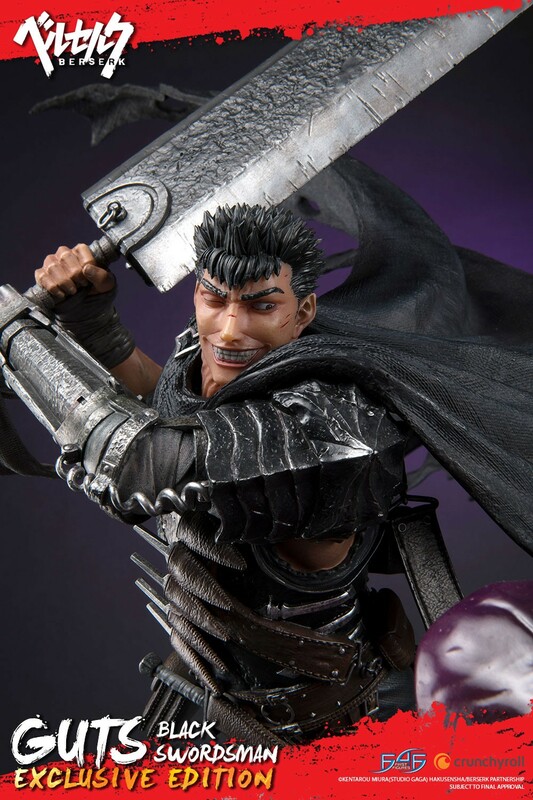 Following the Eclipse (which was prompted by Griffith), Guts began a two year war against the God Hand and apostles becoming increasingly aggravated on his quest for retribution. 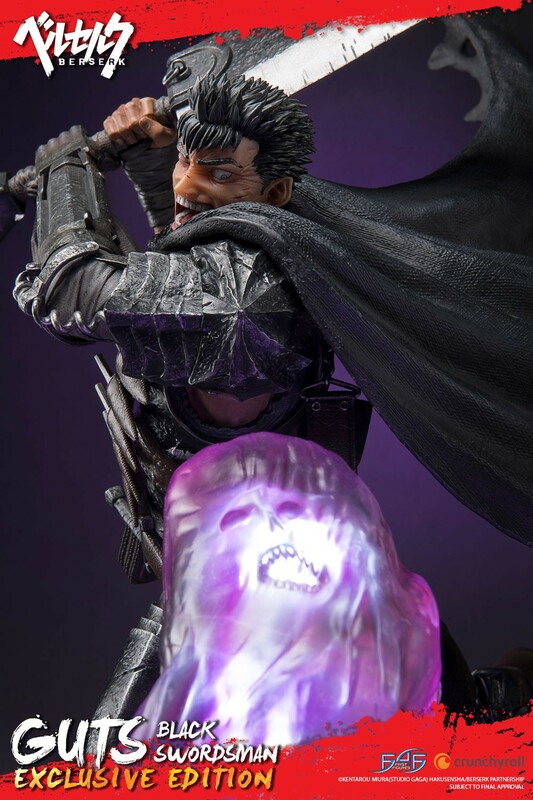 During that time he realizes protecting Casca (his regressed lover) is more important to him than his quest for revenge. 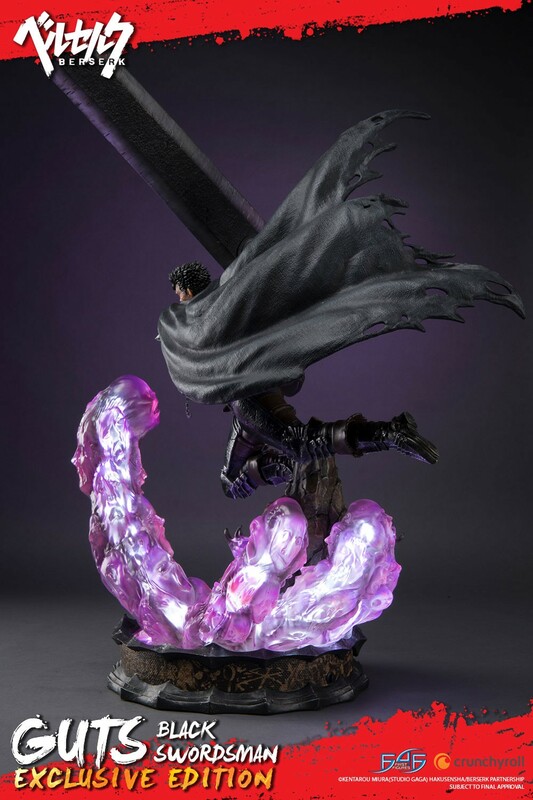 Highly detailed base capturing the intense Blood Spirit fight scene during the Conviction Arc from the Berserk series. 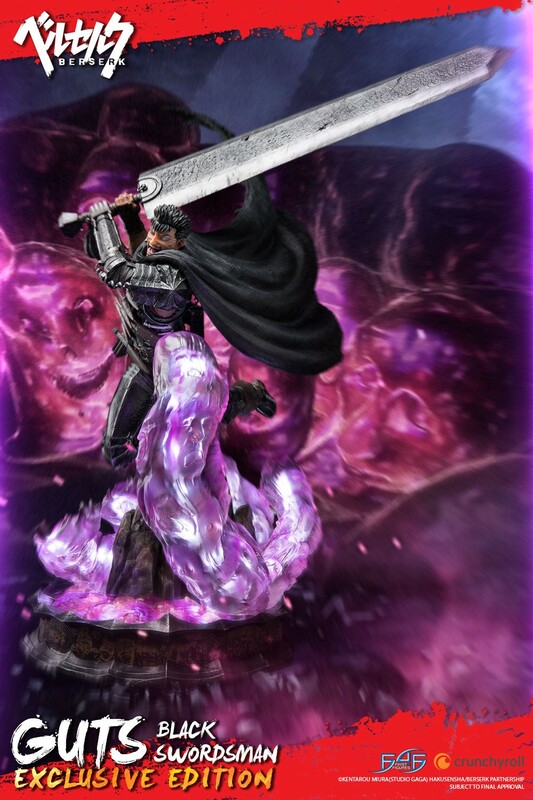 Purchasing the Berserk: GUTS: Black Swordsman EXCLUSIVE edition at anytime during Day One after the launch starts (24 hours) will entitle you to the following extra free bonuses. 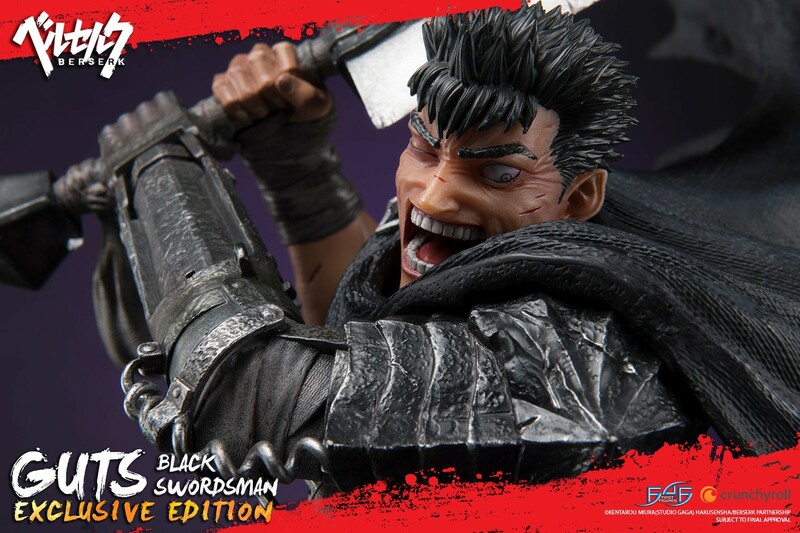 NOTE - You must come back to the website on 10th April 2018, log into your account and VALIDATE your order to confirm your Day One edition. 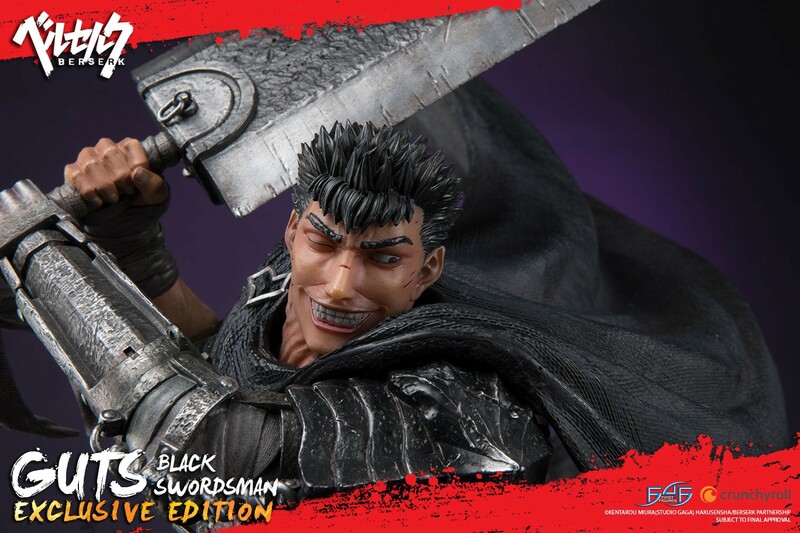 This PREORDER period will close on 20th April 2018. 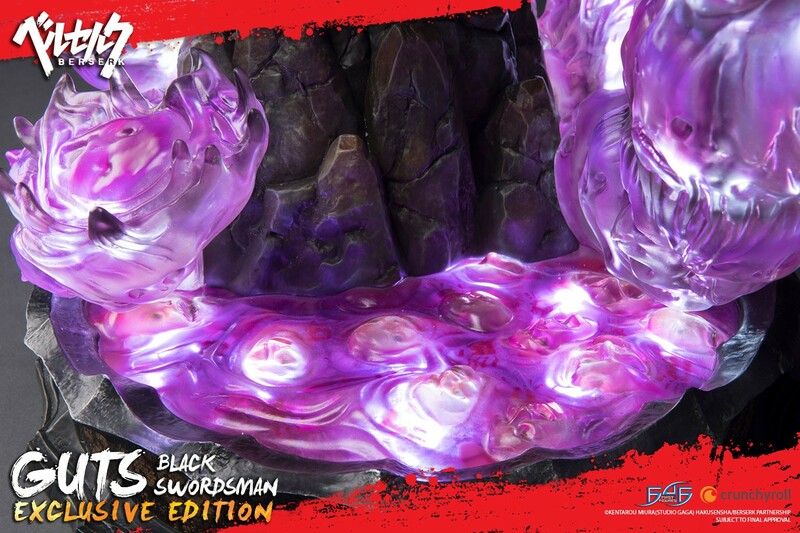 Then RE-OPENS for LAST CHANCE WEEKEND from 4th May 2018 onwards. 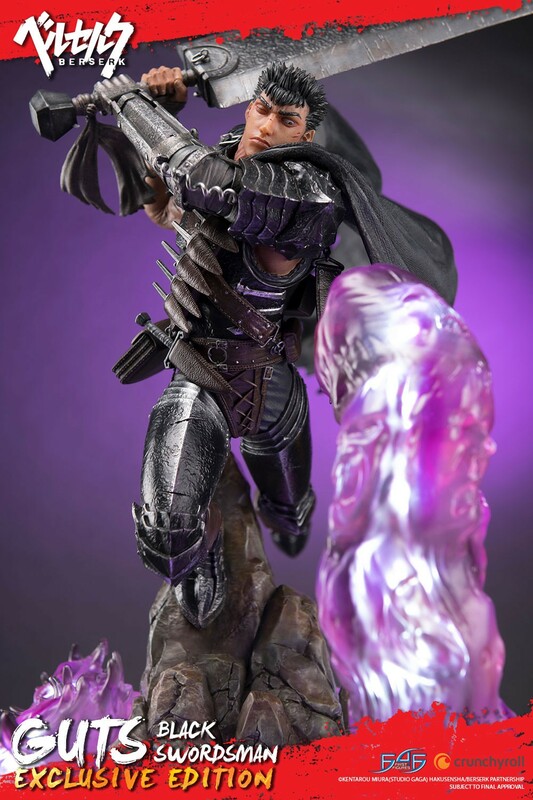 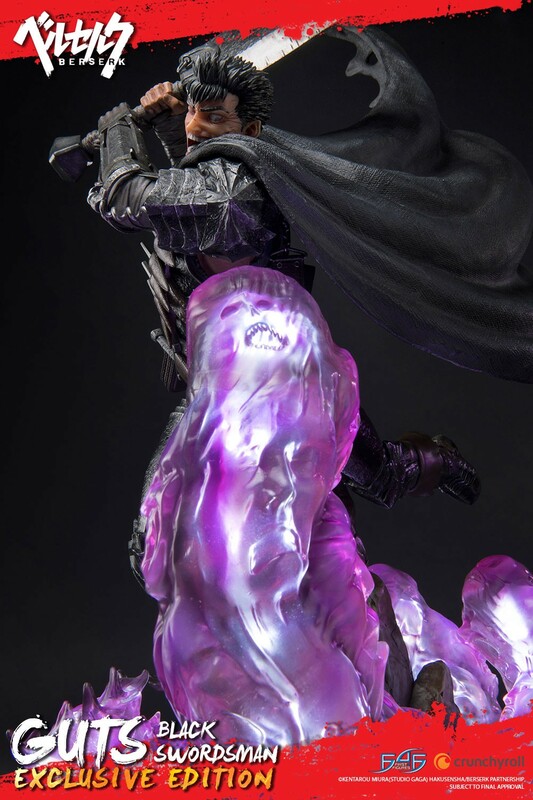 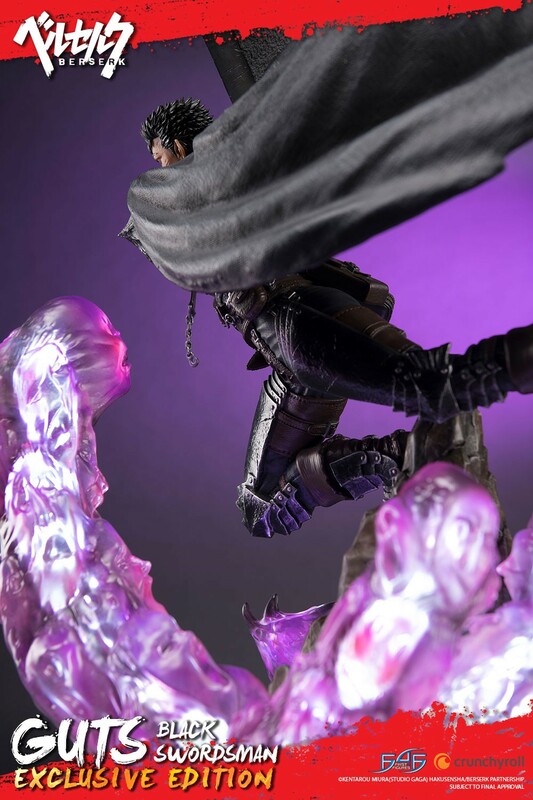 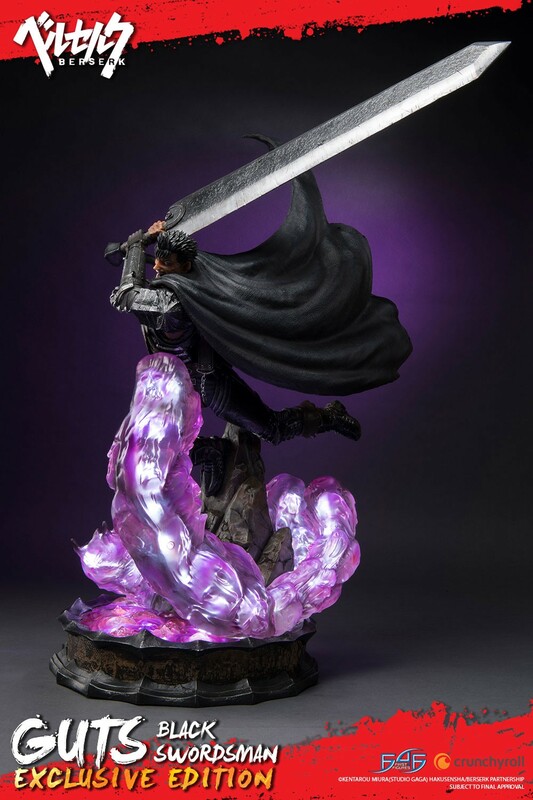 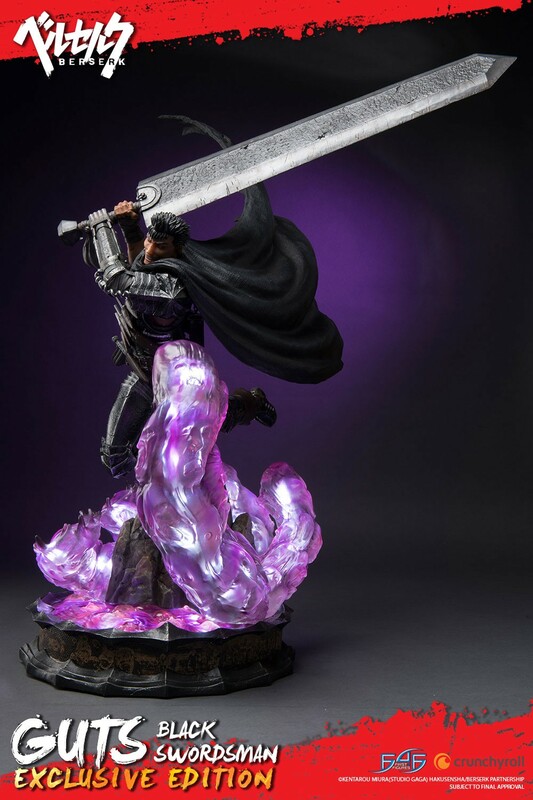 This is the first statue in First 4 Figures’ Berserk Resin Statue line. 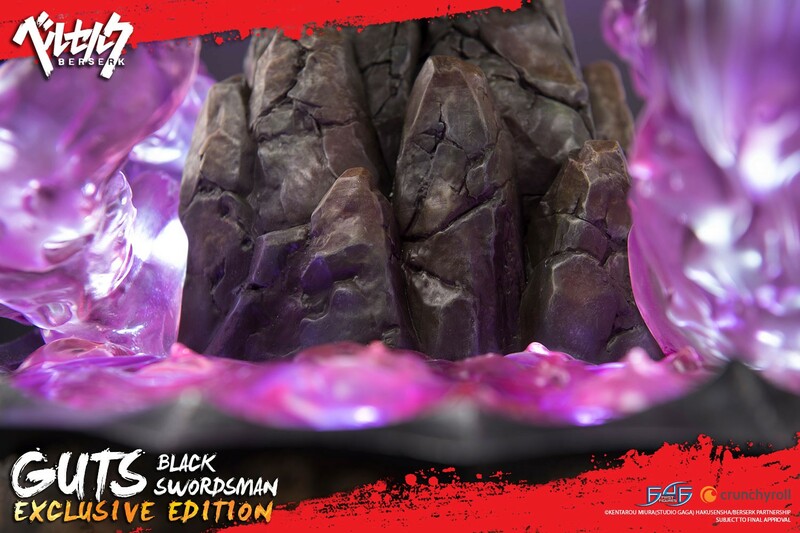 The lowest numbers will be available to those who pre-order earliest, so don't delay if you wish to have the best chances of securing a low number! 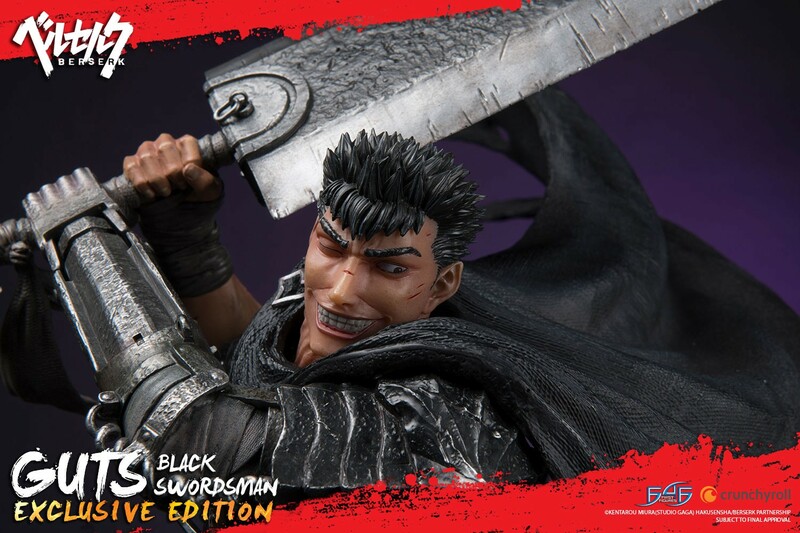 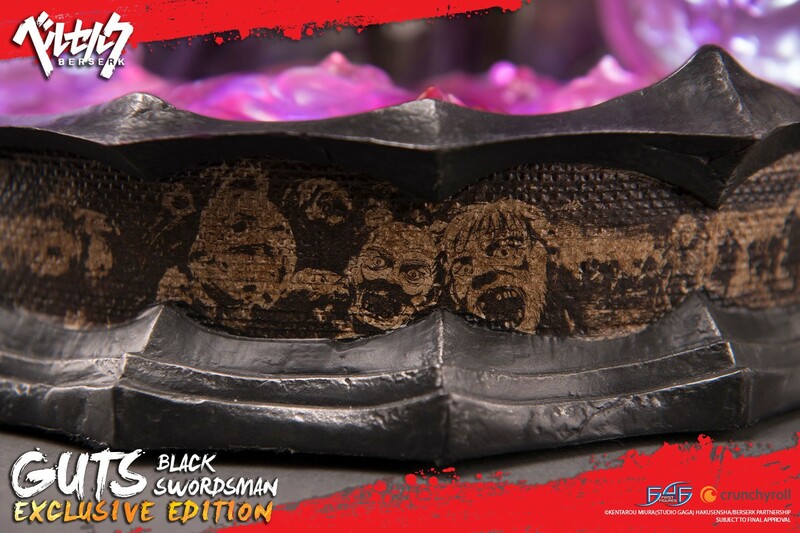 Everything you need to know (and more) about the Guts: The Black Swordsman pre-order!